The light emitted from a particular type of laser has a therapeutic effect on the tissues of the body. These type of lasers are termed low level or cold lasers because the intensity of the light beam that is produced does not cut or burn the tissues that it is directed at. 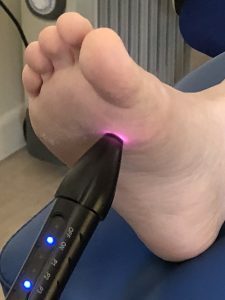 Low level laser therapy (LLLT) is remarkably safe, painless and effective in speeding up healing, especially in stubborn and persistent chronic conditions. The laser light penetrates into the body where an interaction between cells and photons takes place causing a photochemical reaction, which is known as photobiomodulation. This process is similar to photosynthesis when plants absorb light energy from the sun but instead it is the cells of the body that are stimulated producing physiological activity by changing cell membrane permeability. The photons are absorbed by the mitochondria which are like the power houses of the cell. Anti- inflammatory action to reduce swelling and decrease pain. Increased vascular activity with vasodilation in blood vessels and increased blood flow, bringing oxygenated blood into the tissues and flushing out metabolites.